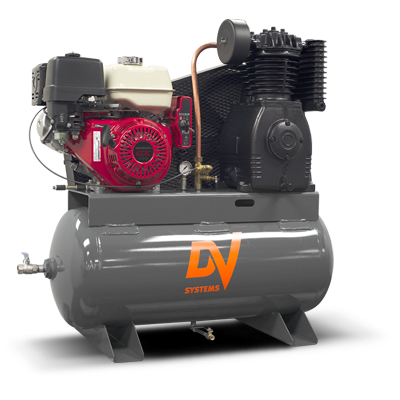 The HDI Gas Powered Air Compressor by DV Systems is equipped with the legendary DV systems 247 heavy duty pump. Either as a base mount or on a 30 gallon air receiver this HDI Gas Powered Air Compressor , matched with a reliable Honda engine will perform well for many years. Perfect for remote job sites with no electricity or for mobile applications. These heavy duty pressure lubricated industrial Air Compressors are extremely reliable, easy and economical to maintain and have the highest performance. Some of our customers include farms, home builders, mobile spray trucks and mobile tire repair vehicles. We at Centrair Air Systems are proud to sell and service these compressors.